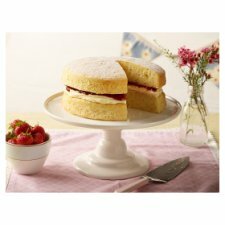 Bring out the baking angel in you and whip up this most versatile of cake mixes. This Vanilla Cake is marvellously quick and easy to make and delicious - just fill with jam and Betty Crocker™ Vanilla Buttercream Style Icing for a fabulous finish. Everyone will want a slice! Grab your apron and mixing bowl and fire up your oven to 180ºC (160ºC for fan assisted ovens)/Gas Mark 4. For cupcakes bake in a fan assisted oven at 160ºC. It's baking time! 2 Pour the cake mixture evenly into your two greased cake tins. For cupcakes pour mix evenly into the cupcake cases**. 3 Bake in the centre of the oven for between 22-27 minutes or until a rounded knife inserted fully into the centre of the cake comes out clean. For cupcakes bake both trays together for 18-22 minutes**. Then cool on a wire rack. 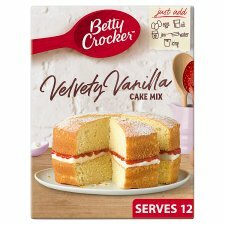 To make the most perfect Victoria Sponge Cake, put a layer of Betty Crocker™ Vanilla Buttercream Style Icing on the bottom half of the cake and then a layer of strawberry jam, sandwich together and sprinkle with icing sugar... cake perfection! Try adding fresh fruit to the middle and the top of a refreshing twist!